The New Democrats' freshly minted federal leader spent his first day on the job visiting Parliament Hill and pledging to raise his party’s profile, despite not having a seat in the House of Commons. The New Democrats' freshly minted federal leader spent his first day on the job visiting Parliament Hill and pledging to raise his party's profile, despite not having a seat in the House of Commons. Jagmeet Singh could not sit in the House during question period, but he held a scrum in the foyer of the Commons and said he was "comfortable" not being an MP. "I'm comfortable right now with the fact that I don't have a seat," Singh told reporters Monday. "Other New Democratic leaders that have been incredibly successful, like Jack Layton, haven't had a seat and have spent the time getting to know the issues that matter to Canadians." "I've also said I'm open to hearing suggestions and counsel on this, so I haven't made a decision, but I am comfortable where I am right now." Singh said he would consider running for a seat before the next election, but needed to find one that had an "authentic connection" with him. Singh has lived in St. John's, Toronto and Windsor, Ont. 'He captivated people': New NDP leader gets preliminary stamp of approval on P.E.I. 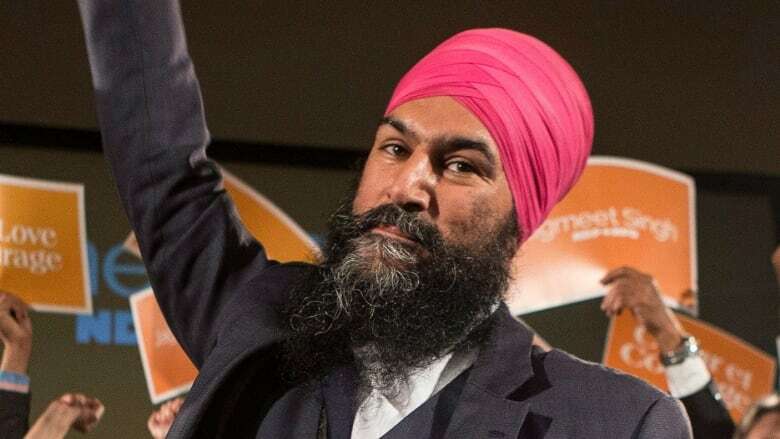 In the meantime, Singh said, he was confident he would be able to lead the party on the four key issues of his campaign platform: inequality; climate change; reconciliation; and electoral reform. "These are pillars that people are already working on in our caucus, people have championed these issues," he said. "We have a phenomenal team and I'll work with them to ensure that the work in the House reflects the work I'll do on the road." Until Singh does secure a seat, he will appoint a member of his caucus to lead in the House while he travels the country to build up his national profile. That person has already been chosen and Singh said an announcement would come soon. Without a seat in the House Singh is also without a salary, but he said his party would be providing that and would reveal more details later. Singh said he had spoken to former NDP leader Tom Mulcair and Prime Minister Justin Trudeau. Mulcair told his successor to make sure he had fun in the job, while Trudeau told Singh to stay true to his party's grassroots. "If I was a kid, and you told me that in 30 years I would get a call from the prime minister, I would have told you, like: 'I don't know what you're talking about.' So it was pretty cool, I'm not going to lie, it was a pretty cool experience," he said. Later on CBC News Network's Power & Politics, Singh was asked by guest host Terry Milewski if he thought he would have a problem winning support in Quebec. The wearing of overt religious symbols has been an issue in the province, and Longueuil–Saint-Hubert MP Pierre Nantel has publicly expressed concern about such symbols. "When I go to Quebec I find that the people are open-hearted, open-spirited," Singh said. "It's one of the most progressive provinces in Canada with low tuition fees and affordable daycare. It's a province that's very open to the social democratic and progressive values that we have. "I am confident that if we lead with the values and policies that speak to the people of Quebec in terms of issues that matter, that we will not only maintain our seats in Quebec but we will grow," he said. Singh was also asked if he condemned Sikhs in Canada who still display posters of Talwinder Singh Parmar, who is publicly celebrated to this day as a shahid — a martyr — by his devotees. During the Air India trial in Vancouver, the defence, prosecution and judge all agreed that Parmar was the mastermind of the Air India bombing. Parmar was never put on trial for the bombing, however, and in 1992 Indian police caught and killed him while he was on a mission to buy Stinger anti-aircraft missiles from the Pakistani Taliban. Singh said the bombing was a "heinous massacre" that is condemned by Sikhs, Muslims and Hindus, but did not specifically denounce those who hang posters of Parmar and celebrate him as a martyr. "I don't know who's responsible [for the Air India bombing] but I think we need to find out who's responsible, we need to make sure that the investigation results in a conviction of someone who is actually responsible," Singh said.